Google today has not only announced the next-gen Chromecast 2 for video, but also a new dedicated device for streaming just the audio to speakers in your home called Chromecast Audio. The new devices feature all new design and come in multiple color options. Here are the full details. We got our first ever look at the new Chromecast around ten days ago in a set of leaked photos, but there was no real way of authenticating those images. As it turns out, Google’s unveiling today corroborates those leaks which gave us a blurry look at what seemed to be a disc of sorts. A total departure from the stick form-factor, Google has gone with a flat disc-housing for its streaming device which comes with an integrated HDMI cable for an easy connection to pretty much any device. The Android-maker will be making the device available in three colors: black, lemonade, and coral with the latter two color choices being exclusive to Google Store. The new Chromecast finally supports both 2.4GHz and 5GHz bands as well as 802.11ac Wi-Fi standard, and houses an “entirely new adaptive antenna system”. This should significantly improve the Wi-Fi performance of Chromecast as identified by Google in the keynote. That’s not the only performance improvement play Google is going with, it has also introduced a new feature called “Fast Play”. To explain it in simplistic terms, the device will pre-fetch video content from a video streaming app that it thinks you may want to watch, before you begin playing. As for supported apps, there are over “a thousand apps” to choose from right now; most notably Sling TV, Google Photos, Discovery, Netflix, DirecTV, NFL Sunday Ticket, and many more. 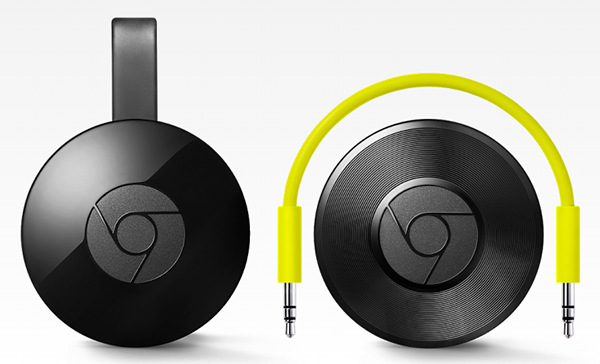 4K TV owners may be disappointed with the Chromecast coming in with 1080p support only. Meanwhile, the Chromcast app has also gotten a complete overhaul, along with the addition of a new feature called, “What’s On” that lets you check out the top viewed content from the rest of your streaming apps without interfering with an ongoing streaming. 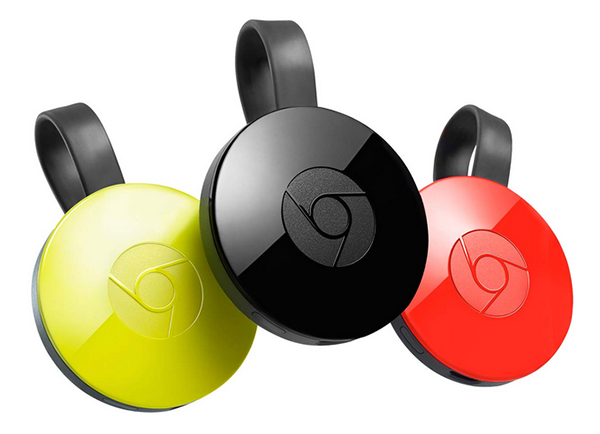 Chromecast will be available starting today in 17 countries and will carry a price tag of $35. That is actually a surprisingly low price point if you consider the competition. Akin to the buzz surrounding the next-gen Chromecast, Chromecast Audio also made a appearance in a set of leaked photos alongside the the regular version. What follows, is a similar story as the design of the device corroborates the early rumors, including the name itself. This nifty little audio streamer does exactly as the name suggests; it will stream audio from Chromecast supported apps directly to your speakers or audio system. How? The device supports 3.5mm auxiliary input, RCA jacks, and an optical input, with the best part being that the Chromecast Audio will send audio from your Android or iOS device from the brand new Chromecast app as well as third-party apps that add support for Google’s Cast. Pandora, iHeartRadio, Google Play Music, TuneIn Radio, and behold; Spotify apps as well are all supported. Google is apparently working on bringing a multi-room sync function to the device later this year, which will pit Chromecast Audio against the likes of Sonos. 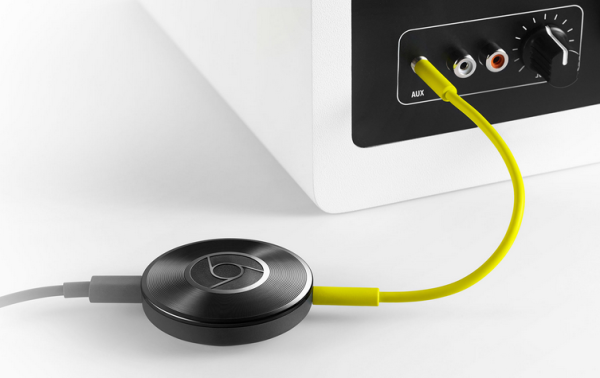 Chromecast Audio will be available starting today in 17 countries, and like the Chromecast, will cost you $35. Choice of color in this case? Black only. Still no remote? I’ll stick (no pun intended) with the Roku. True…it’s too raw to pass the “living room test” and that’s why it still remains a “geek” product instead of a mainstream. Waaaaath!! i’ve just bougth the first chormescast last week. Well, i still preffer apple TV instead.